This year marks the 50th anniversary of the Philadelphia era of God's one true Church. 1983 is, in the words of Pastor General Herbert W. Armstrong, our "jubilee year." Throughout the years God's Church has faithfully kept God's annual festivals, including the Feast of Tabernacles. This will actually be Mr. Armstrong's 57th Feast of Tabernacles. He and his wife Loma observed the annual Holy Days alone beginning in 1927. The Philadelphia era of God's Church (Rev. 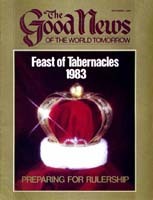 3:7-13), which began in the autumn of 1933, began keeping the Feast of Tabernacles in 1934. From the smallest of beginnings, with just a few brethren meeting at one site in Oregon, the annual Feast of Tabernacles has become the largest convention on earth, attended by more than 100,000 people at more than 80 sites around the world.